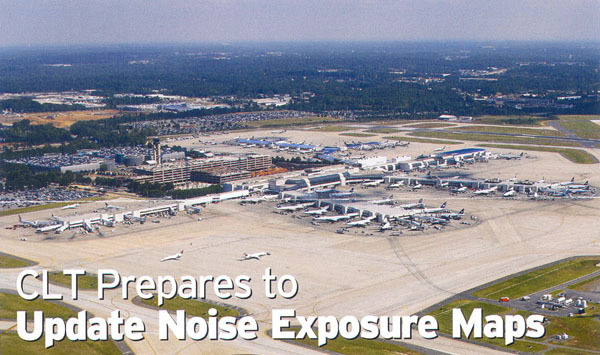 (December 15, 2014) The Charlotte Douglas International Airport is updating its 1996 Noise Exposure Map for 2015 and creating a 2020 map for the future. The map identifies areas that have a day-night average sound level (DNL) of 65 decibels or more, See Noise Exposure Map Update Study. The purple line shows the 65 DNL contour projected to 2020. Although noise from individual airplanes exceeds 65 decibels for many miles beyond these contours, the standard is the average noise level rather than the maximum level. According to airport and consultant staff attending the Public Information Meeting at Olympic High School on December 4, the maximum noise level measured at the interstection of Shopton Road and Gable Road near Sullivan's Trace neighborhood was 83.1 decibels. According to a noise chart avalilable HERE, 80 decibels is equivalent to the sound of an alarm clock. An alarm clock is loud enough to wake a sleeping person. However, the average decibel level is much lower than that (at least below 65 decibels) because the 83.1 decibel level is averaged with the much quieter levels experienced between airplanes. Staff also reported a maximum noise level of 74.1 decibels measured at a spot in the Taragate neighborhood off Sandy Porter Road. 75 decibels is equivalent to the sound of a toilet flushing or a vacuum cleaner. As staff stated several times, the noise study must follow guidelines developed by the Federal Aviation Administration (FAA). If the study included a map showing the loudest noise levels made by airplanes, the contours would extend far beyond the mile and a half or so from airport runways as shown in the study. It would seem that a sound loud enough to wake sleeping people ocurring every two minutes or so would be recognized as affecting quality of life in residential areas, but according to FAA guidleines, it is not. However, the airport is not going anywhere, and airplanes aren't going to stop flying over Steele Creek, so noise will continue to be a fact of life here. The updtate does not recommend changes to airport operations that will reduce noise, it only identifies areas where properties are eligible for noise abatement programs. One aspect of airplane noise may be changing, however. Currently airplanes arriving and departing the airport follow a few set routes, resulting in continual noise over the same neighborhoods. 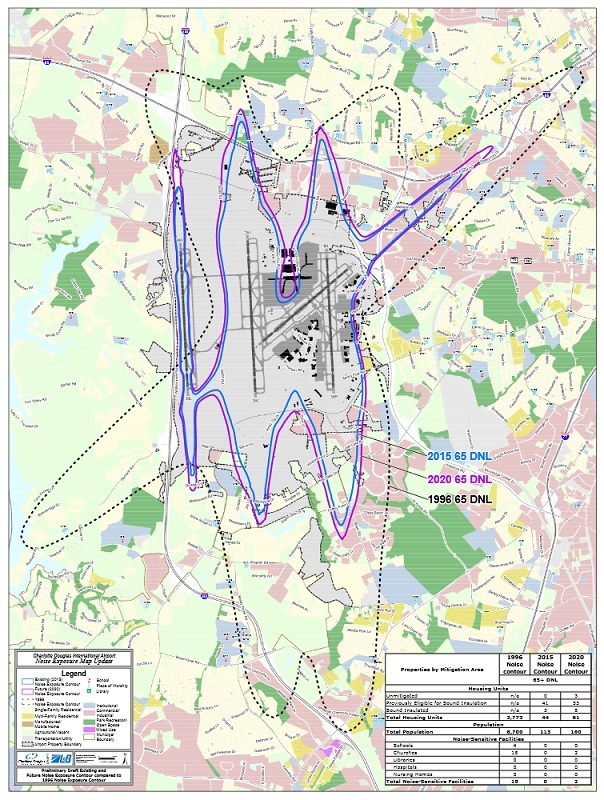 The FAA is proposing to optimize routes for aircraft departing and arriving at the Charlotte airport. The result will be increased efficiency but also a dispersal of routes leading to and from the airport. This dispersal of aircraft routes will also mean a dispersal of noise. The noise will still be there but not constantly over the same neighborhoods and houses. See FAA Plans to Change Airplane Routes and Disperse Noise.